Punit Prakash, Kansas State University associate professor of electrical and computer engineering and Keystone research scholar, has been named recipient of the Paul L. Spainhour Professorship in Electrical Engineering. Funded by a gift from Paul Spainhour, Overland Park, a 1969 graduate of Kansas State University in electrical engineering, the professorship was established to help attract and retain the highest quality faculty in the department of electrical and computer engineering in the College of Engineering. Prakash joined the department as an assistant professor in fall 2012, and is also an affiliate of the K-State Johnson Center for Cancer Research. He is the director of the Biomedical Computing and Devices Lab, which he established to focus on developing technologies for enabling precise image-guided medical interventions. He is currently principal investigator for a five-year study that is expected to lead to a bronchoscopic microwave ablation system for treating lung tumors. The project is funded by a more than $1 million grant from the National Institutes of Health's National Cancer Institute. The author and/or co-author of more than 30 peer-reviewed journal publications and more than 50 conference presentations, he is also co-inventor on two patents — one issued, one pending. 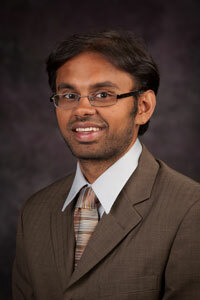 Prakash received a K-State College of Engineering Outstanding Assistant Professor award in 2017, Innovative Research Award from the Johnson Cancer Research Center in 2012 and 2014, and K-State Faculty Development Award in 2012. His research students have received Young Investigator Awards from the Society of Thermal Medicine in 2014, 2015 and 2016.